Does your relationship get pushed to the back burner with all your other commitments? Would you and your partner appreciate setting aside a day to focus on each other and your relationship? 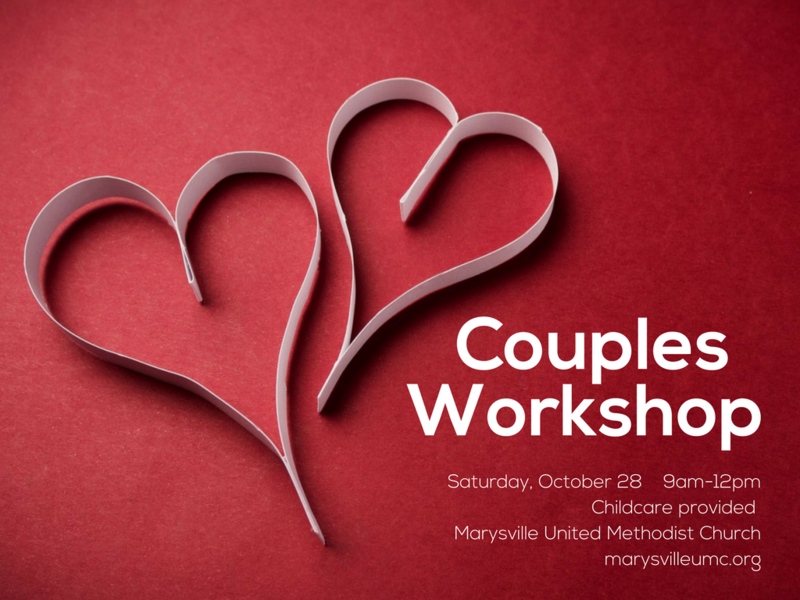 All couples are invited to a one day couples workshop with our own Melinda Mulvaney, M.Ed., LMHC Saturday, October 28. We’ll meet at church from 9:00-12:00 pm. Childcare provided. We’ll cover communication, finances, parenting, intimacy, time priorities and more in an interactive style. Sign up at www.marysvilleumc.org/relationships or in the yellow sheet. Past participants: "The workshop was life changing for us so I am very thankful you did this for us." "Great refreshment for our marriage and new insights! Loved being able to talk with spouse one-on-one on what we were thinking/learning/applying."